Students of steeze: Here's how you could win a brand new complete longboard skateboard! 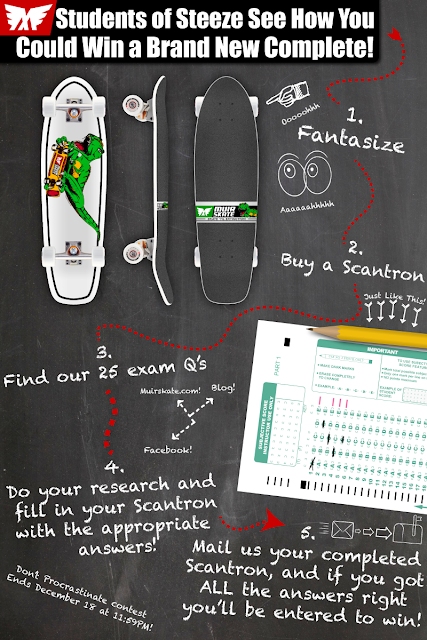 Take our "Final Exam" and mail in a Scantron for grading and a chance to win one of (3) of our new MuirSkate "Mini Dino" Completes! In case that's not descriptive enough for you, here's a step-by-step process for winning a new complete longboard skateboard! Fantasize about your new board! Locate the PDF featuring our 25 Final Exam Questions! Do your research (via our YouTube channel, Instagram account, our blog, etc…) and fill in your Scantron with the appropriate answers! Entries must be received by December 18th, 2016 at 11:59pm! If you have a mailing address inside the United States, you can enter the MuirSkate Final Exam Contest. All contest prizes will STRICTLY be mailed to an address located in the USA. If you are located outside the USA, you must provide an address to a local freight forwarder, friend, or family member. Very Cool! Im on this! Love the Scantron idea!